A monthly tabloid published in Missouri and covering the Irish-American communities in the adjoining states of Kansas, Nebraska, Iowa, Illinois, Arkansas and Oklahoma. 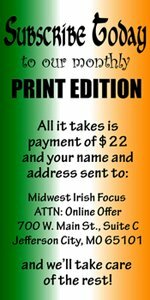 A member publication of the American Irish Media (AIM) network. Irish Guards to perform in Overland Park, Kan. But Kirwan isn’t just a talented musician, having not only written a weekly column for The Irish Echo for some years but also churned out two books, the memoir Green Suede Shoes and the fantasy novel Liverpool Fantasy. 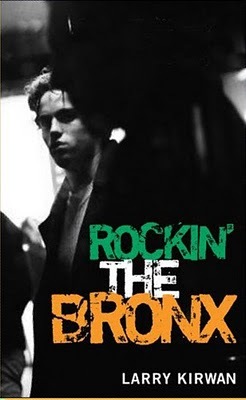 Now, Kirwan can add another title to his growing list of novels with the February release of “Rockin’ the Bronx” from Dufour Editions. In the new novel, Kirwan introduces us to Sean Kelly, a bit of a starry-eyed dreamer from Ireland who ventures to New York City in search of a young woman he soon discovers held more secrets than a cat. Along the way, as Sean learns the ins and outs of an immigrants life in the Bronx in the late 1970s, he encounters everyone from drug-dealing lowlifes and posers to Irish rebels “on the run” from their involvement in the fight in the mysterious North of Ireland. Helping him in his odyssey is a former Gaelic football star and sometime I.R.A. foot soldier Danny McCorley, a man with his own litany of secrets that soon return to doom him as he becomes one of the first victims of the scourge of the day. And it is through McCorley that sean soon latches onto what would become his redemption in this foreign land – music, music that would both sooth the soul and tell the tale of the Irish immigrant experience in the New World. In fact, it is when writing of the influence of music on young Sean Kelly that Kirwan speaks with his clearest voice. In reading this young, and often dazed, musician as he attempts to make sense of a jumbled-up world through the prism of music, and the sexual intrigue of the woman just beyond his reach, he begins to both find and make his way in this new life. Set as it is in the 1970s, the novel makes full use of current events, from the death of Bobby Sands to the early signs of the coming AIDS epidemic, as Kirwan masterfully weaves it all into his storyline. Another character that only becomes apparent as the story progresses is the place, the Bronx, itself that emerges as a character that has just as much impact on the story as any flesh and blood creation. So the novel is more than simply the tale of one man’s search for a woman, it is the story of a community’s search for identity and a place in the world. 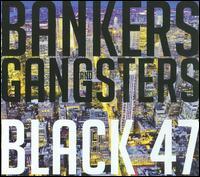 And it is a world that Larry Kirwan has masterfully crafted for his very entertaining tale.